I wished to #EatMoreBBQ so I opened the lid to our decrepit propane grill and promptly closed it shut again. We finished last year’s summer with no bbqing on the deck because the holes in the burners were so large we basically had a huge fireball to grill over. There was so much rust and we had already replaced the grills once – they needed replacing again. “We’re buying a new bbq this year,” I said. “I think we need to, I don’t want to go all summer without one,” my husband agreed. We wandered through some big box stores just to gander at pricing – the ones in our budget were of course, not in stock. Then I found myself in the south of Calgary with only one kid. We had breakfast, we shopped at IKEA and filled the back of the Explorer. On the drive back, we approached Barbecues Galore and I turned in last minute “I just want to check this place out,” I told Nate. He was half asleep and wanted none of it. I dragged him by the hand into the store and was amazed at how many different bbqs they had on the showroom floor. A salesperson met us and gave us a little tour. I told him our price range and he took us over to the Broil Kings. He asked what features we were looking for. Rotisserie? Side burner? Did we know if we wanted stainless or cast iron grills? I hadn’t thought about it that hard to be honest. We didn’t often use the side burner on our old one but it was pretty useless. And I didn’t like the idea of blowing a whole bottle of propane to twirl one chicken about. But rotisserie chicken, oh man, it doesn’t get much better than that. I tried to digest what the salesperson was saying but Nate was on the countdown to the meltdown and I knew we had to get out of there. Besides, I wanted my husband to have a say in what we purchased too. We had been talking about Weber previously because my parents have one that has lasted 10 years. Away we went, I let the salesperson know we would be back another time. Back we went the next weekend with an empty trunk. We found the same salesperson and he walked my husband through what we talked about the previous weekend. We looked at the Webers but the price point was much higher for the features we wanted. It turned out we did want a side burner. 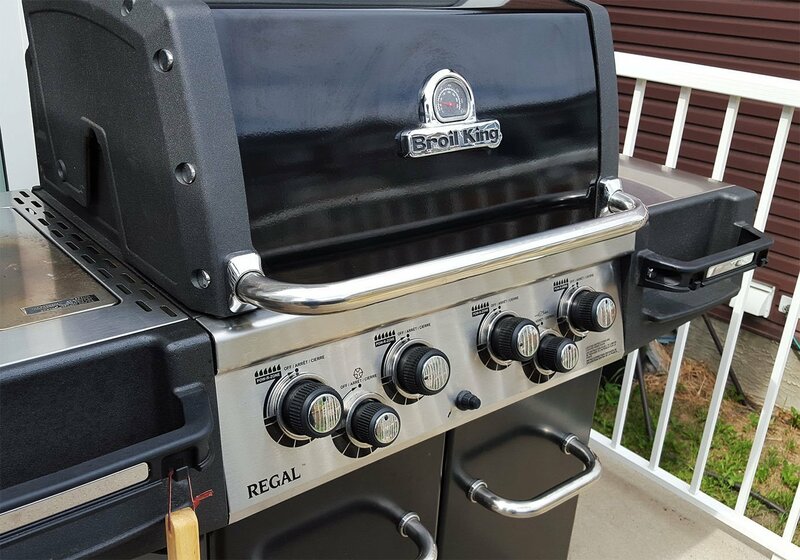 The thing that had us settle on the Broil King Regal Series Grill was the rotisserie burner. It has a special burner at the back of the grill so you don’t need to rely on the main burners to do a chicken. It uses less propane and cooks more evenly as it runs the length of the rotisserie. We also chose cast iron grills because they hold the heat in and it’s more efficient cooking even though, they need a little more care than stainless ones do. At Barbecues Galore, they offer assembly. And it’s only $25! But, an assembled bbq was not going to fit in the back of our vehicle. We live outside of the city so delivery would be over $100 and we sort of stretched the budget as it was with purchasing a new bbq. “I can put it together,” I said. And with those five little words, my fate was sealed. We loaded the grill in the car and off we went. I began my decent into hell a mere few hours later. We cracked open the box and began removing the pieces. I found the warranty/recipe/features book, the baggie of screws and hardware and wait….no assembly instructions. GREAT. Online I looked for a PDF download on the Broil King website. There wasn’t one. There was however a series of videos. Okay, all hope was not lost. I could deal. I began following the videos, pausing when needed. The problem was that it didn’t give explicit instruction about what sort of screw to use where. I tried my best to look at what they were using in the video and try to pick the right one out of my pile of hardware. I failed. We put together and took apart and tried again on most of the steps. I knelt on the concrete garage floor, my knees screaming and cursed. This process took hours. HOURS. And in the end, I discovered we didn’t have enough screws. Did I use the wrong ones somewhere? Maybe. Were they left out of the box? More likely. I scoured my stash and found a few bolts that weren’t quite right but that would work well enough. I was NOT putting this back in the box to put back in the car to drive back to Calgary to return it. No way. No how. In the end, things worked out. I am really enjoying the Broil King bbq now that it’s together. It heats up really hot, is efficient, has all the features we wanted and was a good price. 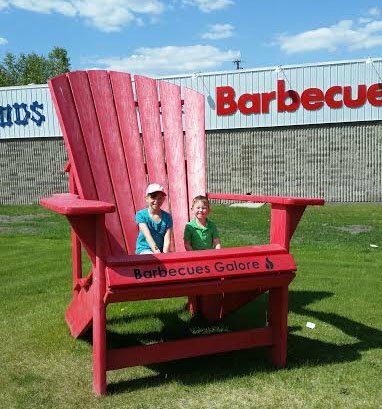 We were also really happy with the service and selection at Barbeques Galore. The sales staff really do know their products, features and benefits, brands, warranty information – all of it. We are lucky to have specialty stores like this here in Calgary. Walking into a big box store where the 15 year old clerk can’t even tell you if something is in stock or not drives me up the freaking wall. The only thing we would change about our experience is budgeting for assembly and delivery costs because I will never, ever put another bbq together in my life. Ever. oooh, love the new bbq! I agree, puting together a bbq is a “I’ll never do this again” moment! so glad you found a store that knows all the details about bbqs. I wish we had done our homework first. We have a high end bbq and it doesn’t work well at all. Just bc the price tag is high, doesn’t mean its amazing. Glad you did your research and the Broil King looks and sounds awesome! Specialty stores are so much better than anywhere else. I am so tired of asking questions at big box stores and getting blank stares in return. UGH. When are you inviting me over for dinner? I love me some bbq!!!! I invited friends over to help me put it together and then to stay for a big BBQ, Worked out really well!! that’s a much better way to do it! I agree with Kyla. We have been shopping at speciality stores more and more. I love to be educated during the buying process rather than surfing on my phone in the store…. And yes! Are new BBQ from barbecues Galore Is a beautiful thing!